As I was cleaning the sewing room I came to the inescapable realization that I've made a lot of little quilts lately. I don't mean the mini quilts, I've only made two of them (and neither of them is finished), I mean the many crib or lap quilts I've completed this year. I couldn't help but think that perhaps it's time to sew something else. 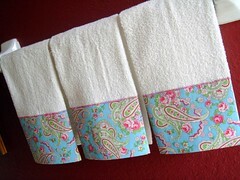 Quick, simple not-a-quilt project ... these hand towels for the downstairs bathroom. I just followed the same steps as the burp cloth tutorial. The towels themselves are from Ikea and really aren't very nice ... certainly more of a kitchen towel than a hand towel, but the alternative is no hand towels at all, so if you happen to come over and notice that my bathroom towels aren't so soft and absorbent, well, just be happy you're getting a towel at all. Hmph. The towels could easily be embellished with ric-rac, ribbon, or whatever. Can you see the red wall? That's the color of the entire bathroom. I don't know what I was thinking, I really don't. I have never liked it but dread the idea of painting over such a strong dark color, so I've left it and nothing in the bathroom matches the walls ... it all matches each other and looks ok with the walls, but absolutely nothing picks up that color. Strangely, after five years it doesn't bother me one bit anymore, though I am very happy it's a large bathroom with lots of light. LOVE em! I think I might have to go shopping! LOL. I've been wanting new handtowels in our "powder room." It's right off the garage, and kitchen and close to the door to the patio, so it gets a lot of use, and I didn't want to spend a fortune on pretty towels. This could be perfect! 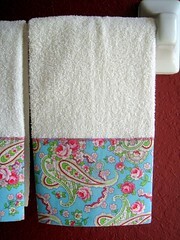 I could get inexpensive plain towels and make them look pretty for cheap! I even have the fabric that will work! THANKS! Hey thats a nice idea. I like them. And if you have to have a darker color on the wall, its gotta be red! Red is great. I painted over black, yes, black paint in my son's room. Two coats of really good primer finally covered it up. I think the towels are great. I'd be proud to use them! Shouldn't the title of this post been "Sew Not a Quilt" ? !